We’re about to head off on our second ever tour of Australia and we can’t wait! Looking forward to visiting some new places and festivals as well as revisiting some of the spots we had such a great time on our first tour. We’re just back from a brilliant, inspiring experience over in Montréal for the Folk Alliance Conference 2019. Three floors of a hotel packed with incredible musicians all showcasing their talents and mixing and jamming in the hallways. Amazing! We met lots of great characters and made a lot of new musical pals along the way. We really enjoyed our showcase spot at the conference so watch this space for news of us returning for more shows and tours in North America in the future! We’re off “Down-Under” again this April for our third trip to Australia and we can’t wait! Over the course of a month, we’ll be touring about Queensland, New South Wales, ACT and Western Australia taking in a number of festivals, concerts and, of course, beaches! Head over to our gigs section for more details. Looking forward to some cracking Scottish gigs to finish off 2018 and bring in 2019! The inaugural 'Live by the Loch' festival at the Broadwood Stadium in Cumbernauld was a smash-hit success! A great day out with music from Dougie MacLean, the Red Hot Chilli Pipers and ourselves. Here's what the Herald newspaper had to say about it: READ ALL ABOUT IT! You can also check out a VIDEO of some of the highlights. In fact, it went so well they've just announced it's going to happen again next year! Looking forward to soaking up the brilliant weather over the next few weeks in Scotland! 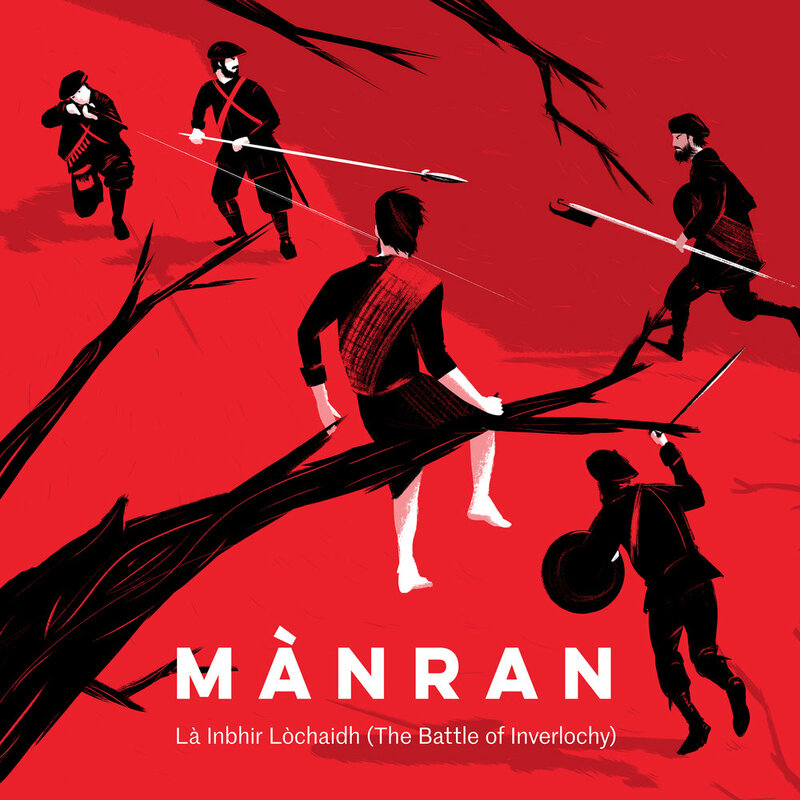 To mark 373 years since the second Battle of Inverlochy, we've released our take on Iain Lom MacDonald's epic account of the battle, "Là Inbhir Lòchaidh" ("The Battle of Inverlochy"). We'll be performing this LIVE at our headline show for Celtic Connections 25th Anniversary Party on Sunday February 4th! Although widely believed that Robert Burns was Scotland’s first Poet Laureate, Charles II named Iain Lom MacDonald as Scotland’s Poet Laureate during his 17th century reign. However as the Stuart line was unseated in 1689, and the subsequent Jacobite Risings failed to permanently restore the Stuarts, their status became a moot point. His stature has further been diminished by the fact that he composed exclusively in Gaelic, which even at that time was a language in decline. Famously stating, when offered a sword to battle, “You battle; I’ll tell”, Iain Lom MacDonald sought out a high vantage point above the battleground below to record a blow-by-blow account (often in gory detail that would make the most hardened ‘Game of Thrones’ viewer flinch). Set against the backdrop of the ‘War of the Three Kingdoms’, the Battle of Inverlochy took place on the morning of a freezing February 2, 1645 on a hill beside Inverlochy Castle, near Fort William. The battle saw a force of 1500 Irish & Highland Royalists fight against 3000 Scots Covenanters. Aside from its wider political importance, the battle was of enormous local significance as one of the largest and most decisive clashes in the centuries-long struggle for Highland supremacy between the MacDonald and Campbell clans. Ultimately the MacDonalds defeated a Campbell army twice their number and forced the Marquess of Argyll to flee in his galley before the fray had even started. Iain Lom, bard to the Keppoch MacDonalds and later the first poet laureate of Scotland, played an important role in the build-up to the action, guiding the Royalist forces on the final stage of their heroic counter-march through 30 miles of wintery mountain passes and providing the crucial intelligence that helped surprise the Campbell force lying in wait at Inverlochy. 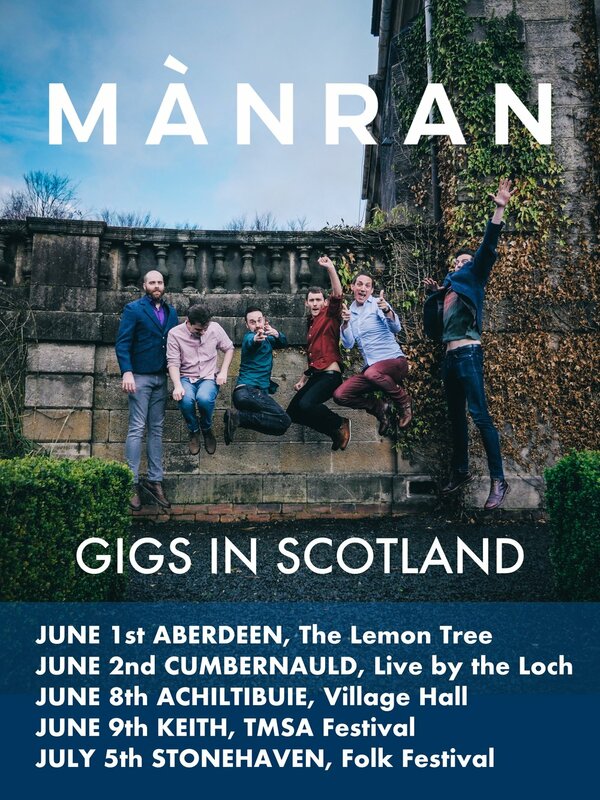 In marking the anniversary of the battle with this new single, Mànran hope to spark a new interest in this fascinating and important time in Scottish history while encouraging a renewed respect for the wealth of Gaelic historical sources and the role they have to play in creating a broader, more nuanced view of Scottish history. Go Gary! Instrumentalist of the Year! Huge congratulations to our very own Gary Innes, who was awarded "Instrumentalist of the Year" at this year's Scots Trad Music Awards. Sin thu fhèin, 'ille, 's math an airidh! ‘An Dà Là - The Two Days’ Nominated Album of the Year! We are over-the-moon to announce that our latest album ‘An Dà Là - The Two Days’ has been nominated in the category ‘Album of the Year’ at this year’s Scots Trad Music Awards. If you’ve enjoyed the album, you can VOTE FOR US HERE! If you haven’t enjoyed it yet, you can get your copy of the album here. Tapadh leibh ma tha sibh air bhòt a chur thugainn mar tha! The summer's here and we're hitting the road all over the place for a run of festival dates! Fad an t-Sàmhraidh, a h-uile Sàmhradh! After a brief bit of time-off to allow people to holiday, work on new material and get married, we're getting back on the road! Looking forward to touring the new album material closer to home.